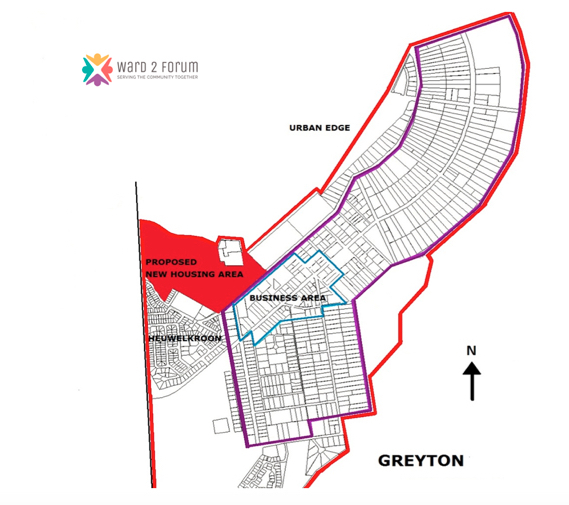 Confirmation that Municipal Housing Land is available in Greyton. I hope that the background and history of this land has been properly investigated before it was “identified”. 1. Inundation of the ground below the sports field during the major flood of 14121998 and again during subsequent floods which occurred in 2006, 2007 and 2008. 2. Proposals that it is possible that a flood detention dam should be constructed on this land, both in the Wouter Engelbrecht “Stormwater Masterplan” of 1998 and the Stellenbosch University ” Greyton River Management Plan” of 2009. As nothing permanent has been done to alleviate flooding the Scholtz River catchment area, this detention dam may still be technically the best and most cost-effective option. 3. Identification, on part of this land, of very rare indigenous flora that needs to be protected. 4. The sports field would have to be relocated. All of these issues would have to be properly addressed before any planning for housing could begin in earnest. Given that 19 years have passed since the flooding issues came to the fore, one can assume that nothing will happen soon. These people need housing now, or at worst, in the near future, this land should probably not be considered. Thank you for your interest and contribution to the debate. It is likely that TWKM have not fully evaluated this, or indeed any other land area, for development as a housing area. At the moment, it is an eyesore not allocated to any other land use, so firstly needs to be evaluated to confirm drainage requirements and any special protection from flooding of the Scholtz River. The only other area in Greyton could be between Buitenkant Street and Eskom substation, which was earmarked for GAP housing until the private School project was launched. In the area, the only other obvious land possibly available belongs to the Minister in Trust for Farm 39. At the moment, there seems little chance of any negotiation between TWKM and Farm 39. When the area has been evaluated and surveyed, before the expensive EIA is started, it should be possible to determine the number of erven that could be developed, with and without relocation of the sports field. You are absolutely correct about the flooding situation – a number of people support the original Wouter Egelbrecht concept. The problem is that TWKM’s Conrad van Heerden (now retired), with his friendly Consultants and Dept of Environment together prevented a full and proper assessment, in particular of the 1:100 year flood, which was estimated to produce twice the flow rate of the earlier flood events, which could create conditions far more dangerous than the inundations so far. They even managed to get our Appeal against the Caledon Street floodway and diversion pipe, rejected under very suspect circumstances. We are not aware of any particularly rare flora here. The statement “the people need housing now, or at worst, in the near future, the land should probably not be considered” is obviously a contradiction in terms – if the housing situation in the TWKM area not been largely ignored over the years, it would not be so acute now. If one accepts that there is genuine need for municipal housing to the extent that we are informed, which according to the current draft IDP is a backlog of over 10,000 houses and over 5000 informal settlement households, it must be imperative that something constructive happens or we can expect escalating reactions from those who are suffering. We can only hope that TWKM are thinking along the same lines.